This is one of several Erebia we saw during a walk up to high altitude in the Pyrenees. This one was frequenting the damp grassland just a little above the tree line. Despite their similarity, I find many Erebia amazingly distinctive now. This one is no exception.........The upperside forewings characteristically have just a pair of ocelli, then in contrast there's a well developed , complete row of eyespots on the hindwing with quite sharply marked pupils. 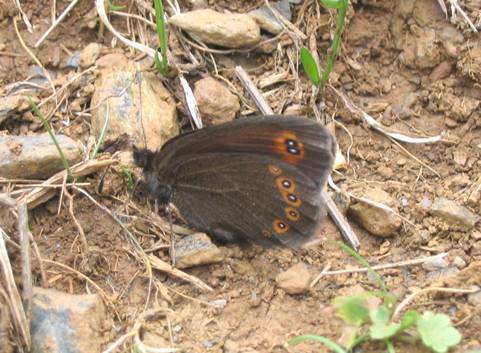 All these markings are equally visible on the underside where the numerous hindwing ocelli are particularly striking against the rather plain brown ground colour. 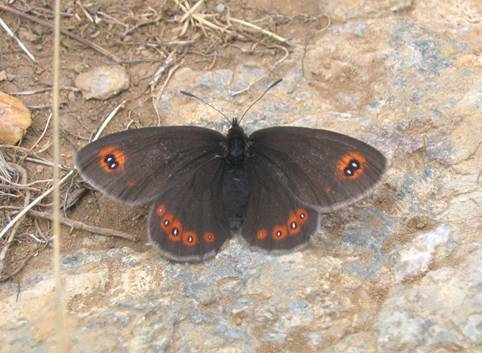 Reputedly males normally have five eyespots on this surface and females six. The photo below would at least support this theory for the female and it appears to me that her second and third ocelli counting from the costa are often enclosed within the same orange band as a result of their orange rings being fused together.